Delicious Extra Lean Shaved Steak, Salami, Fresh Grilled Peppers, Fresh Grilled Onions, & American Cheese!!! Delicious Extra Lean Shaved Steak & American Cheese!!! Delicious Marinated Steak Tips Cooked To Your Liking!!! Eggs Cooked Omelette Style Filled With Our Amazing Shaved Steak!!! Delicious Sweet Italian Sausage Grilled To Perfection!!! Fresh Marinated Grilled Chicken, Salami, Fresh Grilled Peppers, Fresh Grilled Onions, & American Cheese!!! Fresh Marinated Grilled Chicken, Fresh Grilled Onions, Mayo On The Bread Topped With Mozzarella Cheese & Toasted In The Oven!!! Delicious!!! Fresh Marinated Chicken Grilled To Perfection!!! Fresh Homemade Chicken Cutlets Breaded To Order, Marinara Sauce, & Provolone Cheese!!! Fresh Homemade Chicken Fingers Breaded Fresh To Order!!! Fresh Teriyaki Grilled Chicken, Fresh Grilled Onions, Mayo On The Bread, Topped With Mozzarella Cheese & Toasted In The Oven!!! Classic Italian Meats Mortadella, Hot Capicola, Salami, Grilled With Fresh Peppers, Fresh Onions, & Provolone Cheese!!! Amazing Fresh Pork Loin Sliced, Pounded, Tenderized, Tossed In Fresh Italian Bread Crumbs, & Topped With Our Famous Marinara Sauce!!!! Delicious Haddock Pieces Breaded Fresh To Order!!! Hamburger Patties Seasoned & Cooked To Perfection!!! Add Toppings To Your Liking!!! Delicious Grilled 9" Hot Dog Served On An Amazing Grilled Bun!!! Eggs Cooked Omelette Style Filled With Ham, & Fresh Onions!!! Delicious Premium Bacon Cooked To Perfection, Fresh Sliced Lettuce, & Fresh Chopped Tomatoes!!! Fresh Grilled Peppers, Fresh Grilled Onions, Mushrooms, & American Cheese!!! Delicious Battered Eggplant Topped With Our Famous Marinara Sauce!!! Delicious Italian Meatballs Topped With Our Famous Marinara Sauce!!! Delicious Homemade Roast Beef Seasoned & Cooked To Perfection!!! Fresh Shredded Lettuce, Fresh Chopped Tomatoes, Fresh Chopped Onions, Pickles, Hots, & Provolone Cheese!!! Classic Italian Meats Mortadella, Hot Capicola, Salami, & Provolone Cheese!!! Ham, Oven Roasted Turkey, & American Cheese!!! Delicious Premium Tuna Made In House To Perfect Consistency!!! Homemade Chicken Salad Made Fresh In House!!! Amazing Marinated Steak Tips On A Flat Bread Pita With Lettuce, Onions, Tomatoes, & Cucumber Yogurt Sauce!!! Marinated Grilled Chicken On A Flat Bread Pita With Lettuce, Tomatoes, & Cucumber Yogurt Sauce!!! Gyro Strips On A Flat Bread Pita With Tomatoes, Onions, & Cucumber Yogurt Sauce!!! As the original Romano’s in the Merrimack Valley, we have been serving delicious Italian-style pizza, subs, dinners and more for over 20 years. 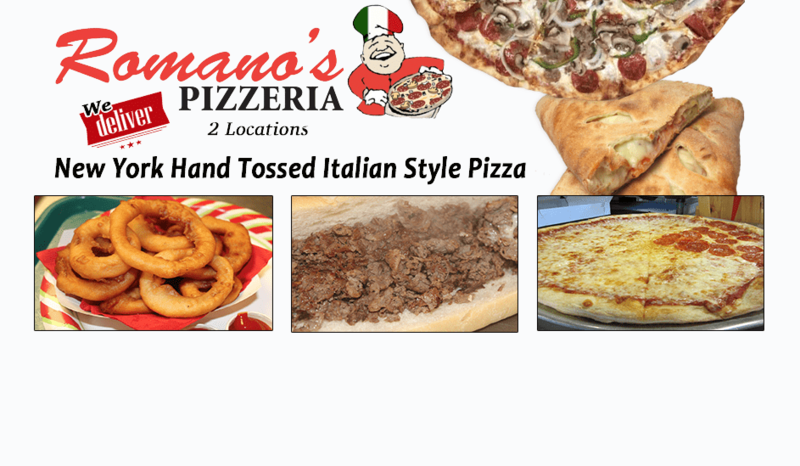 Romano’s is a family run business that takes pride in using top quality ingredients and making our food from scratch. We make our own dough every day and our sauce is homemade. We also hand-toss our pizzas to ensure the crust is cooked perfectly. Please stop by our pizzerias at our Lawrence, MA or Methuen, MA location. We look forward to serving you!